I was thinking about this just now. Why not one surprise free month of rent per year? It makes sense to me. You do your duty by paying your rent every month. It would be nice to get a bonus. One free month of rent per year, the month of which is decided by your landlord — a sort of treat for them, to be able to choose the surprise. When you go to a coffee shop that participates in a punch card system, you are rewarded for your full-punch-card loyalty with one free coffee. It’s hard to think of someone I am more loyal to than my landlord, whom I pay on every single occasion I have to pay a landlord. (Once at the beginning of each month.) I’ve never paid a landlord other than my own for rent. In coffee terms, that’s like buying a coffee from the same shop every single morning. (!) Never traveling to a different coffee shop, never making it at home. (!) It’s crazy! Immediately the problem becomes: If it were the norm that landlords gave one “surprise” free month of rent per year, would they alter their rents for the rest of the year to make up for their loss? Maybe you’re worried you’d get tricked. 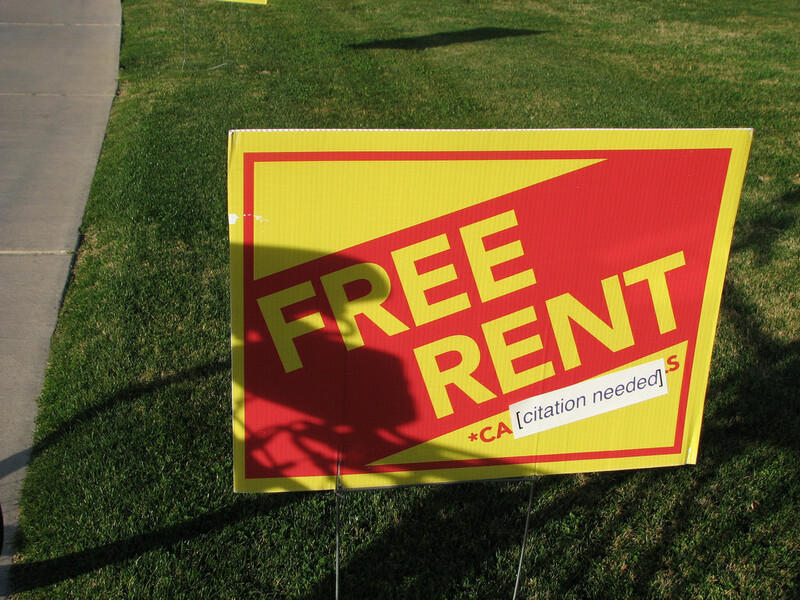 They would do something like that “free month of rent,” net-effective scam you see. Well, that’s easy. For this exercise landlords would not be allowed to do that. Would this hurt landlords who were financially unable to provide one free month of rent? I don’t know. Maybe. Please don’t bring up negative ideas like that when I’m trying to tell you about my fun idea: One free surprise month of rent per year. Imagine it. You write your check for the month and take it downstairs to give to your landlord. (In this scenario your landlord is downstairs.) He or she pops out with a balloon, takes your check, and tears it in half. Surprise! It’s your free month! Now you can take that money and put a little dent in your debt — you deserve it. Would expectation of the free month make it essentially mandatory? Essentially. But maybe there would be a little wiggle room, so maybe it’s a little bit like Santa Claus, meaning, maybe you have to be a pretty good tenant just in case your landlord maybe decides to not give you the free month of rent this year since they are only bound by tradition and not by law. That’s pretty good for the landlord, then. Maybe their tenant is a little better. Pays rent more on-time. Doesn’t listen to Adele so loud in the apartment next to mine, etc. Plus, when you’re given the surprise month, it would be tradition to give a Surprise Month Gift to your landlord. Now that’s nice. Maybe you know they like a restaurant and you get them a gift certificate. Or a nice bottle of champagne. You have a whole month more rent cash than you usually do, anyway. Maybe you “make them cookies,” if you want them to be disappointed in your gift. I don’t know. I bet you’ll think of something nice. Why Not Dogs Can Talk For 25 Minutes Per Day? Why Not A One-Mug Microwave?